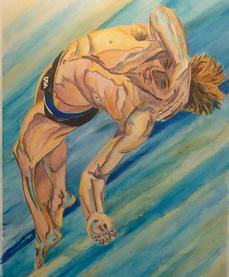 Jordan Gotro left gymnastics and began diving during his freshman year in high school. He was a pleasure to coach because he was hard working, highly motivated and also extremely talented. Jordan has always been very humble as he amassed numerous awards. Division I All-American on platform this year. He is the record holder for the Sac-Joaquin Section Diving Championships. He set the record of 612.55 while winning the Section Championships during his senior year at Oak Ridge High School. I wish him the best at Olympic Trials.